Over the weekend an XDA forum user shared a quartet of photographs, purportedly of the upcoming Google Pixel 3 XL. The new smartphone in the photos is expected to be the larger of the two flagships launched by Google later this year. We had a hint at these designs back in May when some tempered glass screen protectors for the Pixel 3 and 3XL were leaked. In the front facing image, directly above, you can see the screen of the Pixel 3XL powered-on and in-hand. The substantial looking device has quite a large 'chin' compared to many flagships and the notch looks rather deep too. Whether you like this design decision probably rests on how much you value what look like stereo front facing speakers, and your opinion on the ever-more-common notch design. You can just about make out a front facing camera and another pinhole lens/flash/sensor - one either side of the ear-position speaker. The XDA forum member Dr.Guru wrote that the phone in his possession couldn't boot as "it was remotely erased by Google." 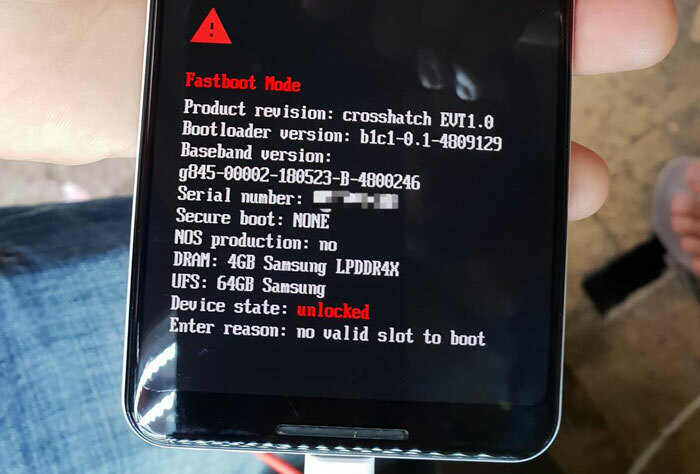 However, it could get to the fastboot screen which shows some of the device's specs. On the screen above you can see that the device boasts 4GB of Samsung LPDDR4X, and 64GB of Samsung UFS storage built-in. Responding to subsequent forum questions, Dr.Guru said the Pixel 3XL is basically the same size as the current 2XL model. Furthermore, my visual impression of that chunky notch was confirmed, as he wrote "the notch is really BIG, probably the biggest I've seen in any phone. 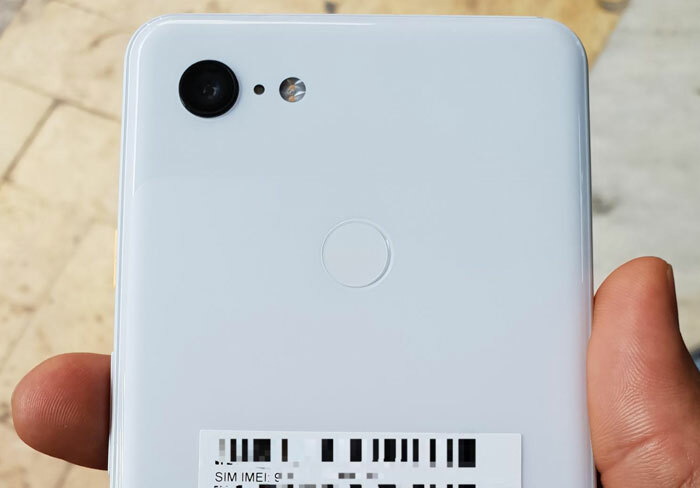 It's the size of 2 status bars or more..."
Round the back you can see Google hasn't advanced to dual- or even triple-lens main camers and has a top-centre positioned fingerprint sensor. On this picture to the left edge you can make out the power button and volume rocker. 9to5 Google reckons there is a Pixel Stand accessory on the way with the release of the Google Pixel 3 and 3XL. It will provide a dock so that users can "Get personalized help" even when the phone is locked. The dock thus converts your smartphone into a kind of Google Home device. 4 Does the Samsung Galaxy Fold hinge and screen lack durability? I'm struggling to see this leak as being accurate but I am also struggling to put into words why i feel like this! I really don't see why other smartphone makers insist upon continuing with the notches. Just because Apple did it doesn't mean that others need to follow in their footsteps. Notches do the opposite of convincing me to get a new phone, they make me stay far away instead. Yuk. 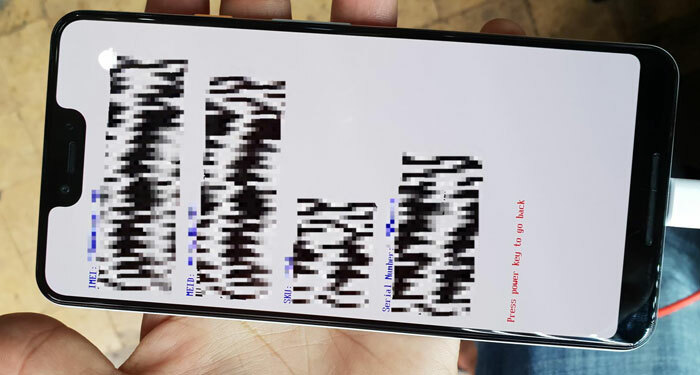 Come on Google tell us all that this was your spoof “joke” phone, you wouldn't really try and sell us all a flagship phone with a big hole in the screen, right? right? This has to be just a big public trolling from Google.